I really like the idea of these diet/fitness journal websites that let you track your weight, exercises, and food/calorie intake. Lots of other people must too, because if you do a quick search, you’ll see hundreds of software tools that promise to help you accomplish these tasks. If you’re a data nerd like me, the thought of being able to analyze all of that information is almost irresistible. And recent weight loss research seems to indicate that in the case of food consumption, there is a benefit to this sort of journaling: In 2008, Kaiser Permanente released results from a study (full text) showing that dieters who kept track of what they ate in a food diary lost double the weight of those who didn’t. I’ve personally tried at least a half-dozen of these tools, including DailyBurn, FitDay, Traineo, SparkPeople, and the Daily Plate. They’ve each got their strengths and weaknesses – some focusing more on diet, some on exercise, and others on building a community to support you in your Quest For Better Health™. However, they all suffer from the same fatal flaw: They’re too much work. All of these web apps want me to sit down at a computer to enter every piece of food I eat and every exercise I do. This isn’t a big deal when you’re sitting in front of a screen during the work day, but it’s a huge inconvenience when you can’t get to a web browser for awhile. Spend one weekend out of town and away from a computer, and the thought of logging three days worth of snacks and meals at once will be enough for you to say “screw it” and call it quits. And ironically, logging your food intake on these sites is even more work if you choose to eat healthy by making your own meals and avoiding processed foods. Because, while processed and franchise restaurant items are almost certainly already in these sites’ databases, there’s a good chance you’ll need to manually add the individual ingredients if you’re trying a new recipe for dinner. Detailed data is nice, but it’s not necessary. If you look at the study above on food diaries, you’ll see that the key was not calorie counting, but becoming more aware of what you’re eating. So, I think a compromise is in order: Instead of tracking just a couple of things in depth, record more items in less detail using a method that has zero friction in its usage. I’ve found just such a solution in your.flowingdata. your.flowingdata is a project created by UCLA graduate student Nathan Yau, author of the FlowingData data visualization blog. This deceptively simple application makes use of Twitter direct messages to log your data, which means you can do it anytime, anywhere from your phone. 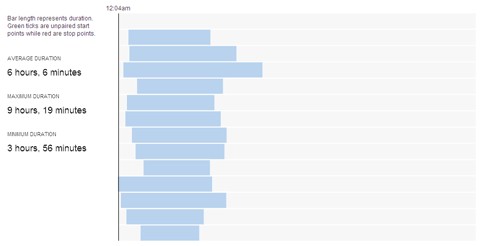 And, it highlights the fact that I haven’t gotten to bed before midnight since I started recording data, and that my shortest night of sleep was just last night (less than four hours, due to an early-waking toddler). Sure, some of the things I’m currently tracking may turn out to be of dubious value. But because logging actions is so easy, there’s really no downside. And who knows – as I accumulate data over time, it might become even more valuable and highlight some trend I wouldn’t have noticed otherwise. Hi Jason, thanks for the thoughtful writeup. I’m glad you find YFD useful :). If you come across any bugs or have any suggestions on what else you might want to see, please do let me know.